Our bodies are amazing in many ways. Amazing and frustrating. Near the top is how we self-heal. Both amazing and frustrating. 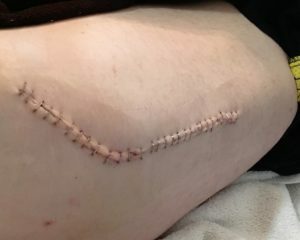 I went in two weeks post-op to have my (metal) staples removed. Had a bunch of them. At least I consider thirty to be a bunch. 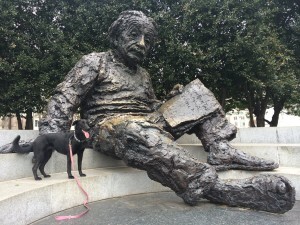 I had never had staples and hadn’t had stitches for…..a number of years. Perhaps I had a couple post-ACL repair of a 25 year old injury in early 2011. Circa 2011: L-ACL repair. That hurt. Certainly no more than three-four-five. Metal staples: never. Now thirty. AWeb courageously shuttled me in for my two week followup in the middle of a record setting snow event. Difficult to call it a snow storm in our ‘hood as less than an inch fell and it was gone by noon the next day. Nevertheless the early morning multi-hued grey sky unexpectedly and unseasonably vomited a mix of rain, sleet and snow on us turning a 28 minute drive into a 40 minute four-letter-word dropping affair. Ninety minutes after stepping out of the car into/onto a mashup of a crutch-dependent persons’ arch enemy I was slow-crutching back out the still crazy slick lobby to my waiting chariot pulled fully under the non-existent weather protected front drive/entryway. It was the eighty-five minutes in between that were a challenge. My knee Doc holds some office hours in this building. I had been to it a couple uneventful times previously. Free garage parking, minimal walk to the building, clean, bright, open feeling suite with a connected, large, airy-looking physical therapy clinic. I like it. I haven’t scheduled time at this location more often because it is a longer drive than the more urban office directly north and closer to home. Given the closer-in traffic-hassles it’s actually not much longer to drive outside the Beltway so perhaps I’ll begin switching my appointment locations with the knee Doc. After two post-op visits to this office I have some unsolicited opinions for the owners, operators and/or tenants of the 85xxArlington Blvd Complex. Signage outside the building indicates it houses Orthopedic offices of some type. I’ve only been to one suite but I’d suspect several other offices are similar if the outside signage is to be believed. First: while the ample, free, relatively close covered parking is mostly great—mostly. This is an orthopedic clinic–people are hurt, injured, about to undergo procedures or have recently come off related procedures. It’s difficult at best to ambulate from your house to the car in your driveway let alone several meters down a winding garage, across a somewhat busy drive to the building. Given the logistics of a multi-level parking garage one would expect a disproportionate number of patients to be dropped off at the door. Unfortunately the drop-off spot is fully exposed to the elements. Even when pulling into the edge of the sidewalk, violating the pedestrian space, no covered space exists to keep the surface dry. Again, many patients struggle ambulating under the best of conditions let alone wet, slushy or icy days. Walking into the building is not much better. A terrific rug runs almost to the elevator bay but if pushed an inch off the rug the surface is as glassy as a sheet of ice. Finally; specific only to my assigned suite: (keep in mind this is an orthopedic office) the restroom doors do not have hydraulic openers. Think about that. Within a clinic set up to help ortho patients no restroom accommodations exist. I realize a sizable share of the patients have a broken wrist or a simple sprained ankle thus pushing a rather heavy door is a non-event. However, for the rest of us………..I was stunned I needed to push open a heavy restroom door with one arm, immediately jam the bottom lip of one of my crutches under the edge hoping it doesn’t slip, then make my way on to the slick floor simultaneously reaching back to release the crutch from the underlip of the door and pull it back before the door closes taking it out from under my arm. In an orthopedic suite. In an orthopedic building. Where a fair number of older folks are patients. And I’m not exactly young. Seems we can do better than this. I made my way slowly across the much-welcomed rug to the edge that falls just short of the elevator bay. I waited for AWeb as another couple had already depressed the up button and I didn’t want to step off the carpet onto the slick floor. Once up and in the office the news was mostly positive. Pain measuring where it should be, flexibility perhaps a little better than expected. Patience (not patient) a little less than it should be. Next steps more frustrating than I want them to be. Immediately, however, would be the staple removal process. Now, this being something new to me I had done as much preparation as possible–loaded up on breakfast which allowed me to load up on Rx. I was prepared for the worst and hoping for the best. Something close to the best started the process: the RN would be doing the yanking, not the Doc. Score!! We immediately took a quick turn toward the worst: she wanted me to hop up on the exam table. Hadn’t thought about that. That thing’s higher than you think when you’ve only got one good leg. Happily medicated. 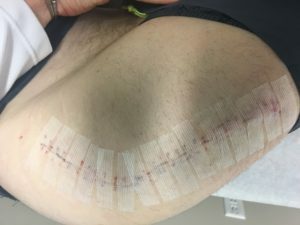 Gently rolling onto my left (good) side and facing the door I yanked down my shorts to fully expose the 18″ long hockey-stick shaped 30x stapled incision. She said I’d feel some stuff. I reminded myself I’d loaded up on Rx before the visit. I was set. Seeing nothing I could hear the clippers each time a staple snapped. AWeb, “How are you doing….everthing ok?” Me, “Yup”. I lost count after a dozen. Snap. Clip. Ping. None of them felt good. A couple of them fell to the floor joining three others I noticed when I initially walked into the room. Sliding a piece of metal out of your skin is never going to feel good but it was fine. Something between a solid bee sting and an annoying mosquito bite. Happily medicated. Now, when a medical professional, any medical professional, tells you ‘it’s in there pretty good’ when they’re doing anything to your body it’s likely problematic. This was repeated a couple times as we were down to only a couple staples remaining. Finally we moved on to, (RN) “I think I’ll need to go find the doc and get him doctor back here to take a look; the final staple has been overgrown by your skin so we’ll need to do something……”. She said this a couple times. At some point I heard ‘cut it out……we need tools….I cannot do this….’. Oh boy. Doc repeats what the RN said as he was poking around at the remaining staple. ‘That’s good. Your body’s doing a great job of healing itself. That’s a good sign.” Doc then gave a bit of a push and pull on the staple. “How’d that feel”. “Ok, fine”. Oh boy. Happily medicated. “We’ll need to get some cutting tools and get under that thing to get it out.” “I agree, looks as if we’ll need a …..something…something….cutting…….slicing…..something”. I wasn’t too medicated to understand; they were simply over talking and moving around and pushing and pulling on me as they were talking amongst themselves. Doc comes back in to the exam room and repeats, “Sorry bud, this is gonna hurt a little. We need to get under the skin and under the staple to get it out.” Crap. AWeb, “You doing ok baby?” “I’m fine.” Crap. Some slicing, tugging, over-talk and some more pulling and cutting and it was out. Doc made another comment about my body healing rate and reiterated that it’s a good thing. My RN put a line of butterfly bandages along the length of the incision and left the room. We made our way out of the building, back into the slippery, slushy mess and onto the road home.